ClotCare was started in 2000 by Henry I. Bussey, Pharm.D. and me, Marie Bussey, his daughter. 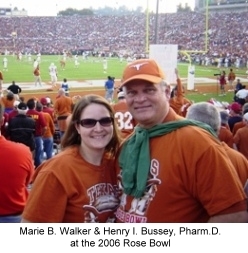 At that time, Dr. Bussey recognized a need to make patient education information available since the maker of Coumadin was no longer going to print patient booklets that many clinicians were used to distributing. In discussing this need for patient education materials with me, we decided that a website would be a useful way to make this type of information widely available. We combined our respective expertise, anticoagulation therapy and information technology, and the result was ClotCare Online Resource. 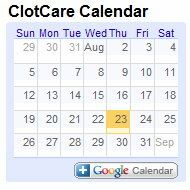 For the first few years, ClotCare was completely a volunteer effort of Dr. Bussey and me, but with extensive new research in this therapeutic area and the development of several new drugs, we realized that there was a real need for rapid and timely dissemination of information about anticoagulation and antithrombotic therapy for patients, their caregivers, and their healthcare providers. Consequently, at the end of 2003, ClotCare Online Resource secured commitments of unrestricted industry support to allow us to expand and improve the site at no cost to ClotCare users. With the funding provided by industry support, ClotCare has grown significantly over the past few years, but unfortunately, changing regulations have made it increasingly difficult to obtain industry support. The result has been an increased demand for ClotCare services at the same time that our funding has become more difficult to obtain. As such, late in 2007, ClotCare became a charitable 501(c)(3) non-profit organization. Now, in addition to industry support, we invite you to become a ClotCare supporter by making a tax-deductible contribution. We greatly appreciate any support you can offer to help us maintain this valuable service. All supporters will be recognized on the website, and donations may be made in honor or in memory of a friend or loved one. ClotCare is very proud to have the input and insight of an incredible panel of experts in this field. You can learn more about Dr. Bussey, each of our exceptional editorial board members, and me by visiting our Editorial Board page where you will find a biosketch of each board member. Over the years, ClotCare has continued to grow, has posted new information regularly, and has answered thousands of questions submitted to our editorial board via email. I invite you to review the resources available on ClotCare, sign up for our email list, and let us know if you have a question or comment for us. You can reach me by email at webmaster@clotcare.org.